Understanding ETH’s value proposition is an endeavor, to put it lightly. Although best left for another post, it must be accepted (at least, for the purpose of this article) that ETH is competing to be a store of value / digital gold, just like Bitcoin is. While many claim that ETH is used merely to pay for gas fees, I’m going to push back on this narrative. Ether is a digital commodity that exhibits many of the desirable qualities of an ideal money, and thus stands to gain a monetary premium. We already see evidence of this in DEXes (where ETH is the primary base currency), Maker (where CDP creators consider ETH valuable, thus allowing them to use it for collateral), and Augur (where ETH is the only betting currency). The crypto community, however, recognizes that there is a need for censorship-resistant payments today. While ETH has enjoyed marginal success as a medium of exchange (and, in rare instances, a unit of account), it is far too volatile to serve as money today. DAI, on the other hand, fits in nicely here. Despite not being a digital gold, nor being as censorship-resistant as ETH, DAI has carved out a niche for itself and continues to grow (currently at ~$75 million circulating supply). The ingenuity of DAI is that it completely skips over the monetization process that ETH has to go through, and piggybacks off of the ‘money’ properties of USD. DAI serves well as a store of value, medium of exchange, and unit of account, at least to the extent that traditional USD satisfies these properties. Of course the trade off here is DAI’s underlying stability, which leads us to our next token. Unlike DAI, fiat-backed stablecoins such as USDC have a very simple and centralized model for their stability. The issuer holds USD in its bank account, and redeems the stablecoin for $1 upon request. If USDC crashes to $0.10, there’s no problem. One can just hand in the USDC to CENTRE, the parent organization behind USDC, and they will redeem it for 1 USD. This process is known as recourse or convertibility, and is guaranteed by CENTRE (and its associated banks). Another way of looking at this is that USDC is collateralized by U.S. dollars. And because U.S. dollars are not (and cannot be) blockchain tokens, this process must necessarily be centralized. But as long as the collateral does not fail (and why would it? It’s tucked away neatly in a bank), there’s really no reason for USDC to fall to $0.10. If it did, arbitrageurs would buy up cheap USDC and redeem for $1. It should be clear that, as long as the collateral exists, USDC will have no issues tracking USD. Ok, but what if it suddenly didn’t exist? What if Coinbase (a founding member of CENTRE), for example, lent out the USD for other investments that have since failed, legally or not? What if Coinbase goes bankrupt? What if the bank behind Coinbase becomes insolvent? What if one simply has no recourse for their USDC? Well, in this case, they’re out of luck. There are two risks that I want to highlight here. The first is if Coinbase is sufficiently collateralized yet USDC still tumbles. This is (for lack of a better term) irrational market risk. While this risk should be arbitraged away fairly quickly, we cannot discount its existence. If USDC is persistently trading at a discount, something’s gone awry, and Coinbase will (or should) wind down USDC and refund everyone’s tokens with USD. While a disjointed price is highly unlikely, it could still occur perhaps due to liquidity constraints or insider knowledge of some impending regulatory action or even some soon-to-be-exploited bug. On the flip side, a persistently expensive USDC is also an unlikely risk, but one to be cognizant of regardless. The second risk is counterparty/collateral risk. This is where the USD actually no longer exists. Without sufficient reserves it’s unlikely that investors will continue to have confidence in the recourse mechanism (and thus USDC will fail to maintain its peg). To assuage investor concerns, Coinbase undergoes periodic audits in order to provide full transparency and prove solvency. Generally speaking, USDC mitigates these issues through centralized operation. DAI, on the other hand, must deal with these two risks (irrational market and counterparty/ collateral) without sacrificing its decentralization (i.e., relying on a bank). The irrational market risk is dealt with through incentives. If DAI falls to $0.10, CDP owners will buy up cheap DAI and repay their outstanding loans for cents on the dollar. If DAI rises above $1, CDP creators will issue more DAI and push the price back down. This should theoretically occur until any arbitrage is gone. But if it persists? If someone is about to exploit a bug or conduct a Soros attack? In these scenarios, if DAI is persistently trading at a discount, and, critically, the collateral is all there, then global settlement/emergency shutdown is triggered. 1 DAI can then be redeemed for $1 worth of collateral. The ‘market manipulator’ will have lost a not-insignificant amount of money, and the MakerDAO system can then be reinitialized (if the community so desires). The collateral risk is a bit trickier to deal with, and this is where we finally get to the MKR token. MKR is a governance token that resides on the Ethereum blockchain. In the event of a sudden drop in the collateral value, the MKR token is minted and sold in order to raise funds to cover the shortfall. (I previously wrote about this here.) The set of MKR holders can be viewed as governors, but also as insurers. In exchange for providing ‘catastrophe’ insurance, they charge a premium (in the form of a ‘stability fee’). These governors want to optimize the risk parameters such that they maximize their revenues while maintaining the integrity and stability of DAI. Using carefully-crafted incentives, along with an insurance backstop, DAI attempts to deal with irrational market and counterparty risk in a decentralized manner (depending on one’s definition of decentralization; some view MKR holders as centralized, and others take exception with the incentive structure mentioned above). Whether it is successful or not requires a test of time. So far, the 1 year report card has received a lot of praise (DAI has maintained its peg despite a 94% drop in the price of the underlying collateral). Taking a step back, however, it’s quite remarkable how these 3 assets cohabitate with each other. ETH acts as a long-term store of value. DAI as a short-term medium of exchange and unit of account. 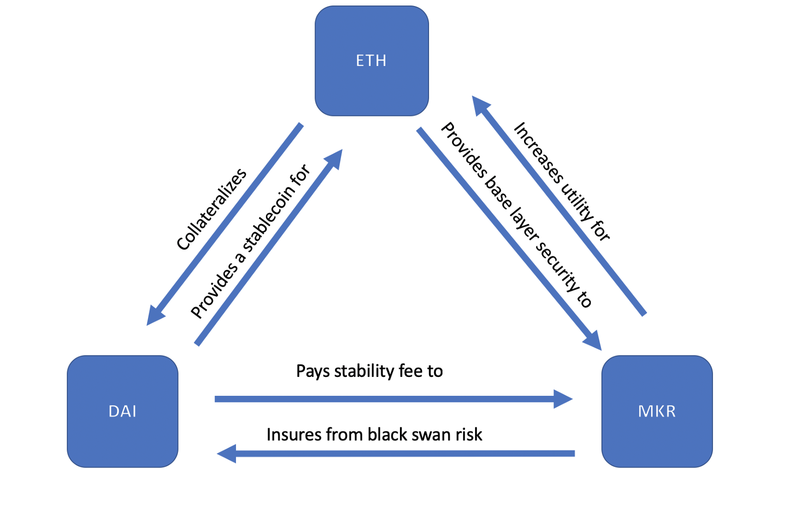 MKR as an Ethereum-based token which provides the governance and insurance necessary to keep DAI stable. While the current model serves us well in the short-run, we can speculate on what the future might look like. Specifically, what would occur if ETH has, remarkably, achieved ‘money’ status. What happens to DAI in this scenario? First, it’s important to note that many different versions of DAI can exist, where each variant can track any asset, stable or not. It just so happens that USD has been chosen as the tracked asset because it is currently the most stable and ubiquitous global currency. Under this framework, the current DAI should really be thought of as usdDAI. However, it is trivial to create euroDAI, yenDAI, s&pDAI, btcDAI, ethDAI, and so on. As long as there is a price feed, an iteration of DAI can be created. Now, let’s also remember that the almighty dollar is not infallible, and even the strongest of fiat currencies tend to collapse from time to time. If USD fails to maintain its preeminent status as the global reserve currency, it’s unlikely that usdDAI will continue to flourish. It would still be worth $1; it’s just that one dollar probably wouldn’t be worth much in real purchasing terms. Recall that the goal of crypto is not to merely put dollars on the blockchain, and USD is not considered sound money since it is subject to arbitrary devaluation. Digital gold was born as a response to the inflationary properties of fiat currencies. So, while DAI functions well as a money today, there are other considerations at play (such as wealth preservation/ store of value). The question then becomes ‘does DAI (of any variant) have a meaningful role in a world that operates atop a native cryptocurrency instead of fiat?’ If ETH were to be stable and utilized as a unit of account, what use would we have for DAI? Certainly usdDAI would become obsolete, but what about the other variants? Interestingly enough, there would still be a need for DAI, specifically the one that tracks ETH (i.e., ethDAI). This is similar to how today usdDAI tracks USD. But what purpose does ethDAI serve if we already have ETH? Wasn’t the point of usdDAI to blockchain-ize an off-chain asset? Why would anyone need ethDAI if regular ETH is already native to crypto? In fact, the key value proposition of MakerDAO isn’t porting off-chain assets into tokens (thereby creating a stablecoin), but rather operating as a permissionless credit facility, where a user can create leverage off of their collateral (and, of course, after the launch of multi-collateral there will be more options available). What we have in ETH and ethDAI are two fundamentally different, yet useful, forms of money: commodity and credit. The archetypal commodity money is gold, but over time we’ve seen many different variants (silver, oil, Rai stones, beads, bitcoin, ether). These commodities don’t achieve a monetary premium based on their intrinsic value or utility (i.e., gold being used for jewelry or electrical wires), but rather because they embody the desirable characteristics of a hypothetical ideal money (scarce, fungible, durable, etc). Credit, on the other hand, is a time-dimensional form of value. By taking a loan against an existing asset, one is essentially extracting its future expected value into a form that can be used today. Typically, it would be difficult to have a commodity money and credit money be fungible with each other (hence why the two forms are distinct). Credit is a form of value that is created upon demand, on the spot. Assuming that a commodity money has a fixed supply (or is sufficiently scarce), then the minting of additional credit money denominated in the commodity is, clearly, quite difficult. It would be hard for a bank to conjure up some gold or ETH* out of thin air if I wanted a loan against my home. (Although, it’s much easier with a fiat currency such as USD, where central banks create credit that is immediately fungible with the rest of the money supply). Therefore, ethDAI, a synthetic version of ETH that tracks the price closely, appears to be a good solution. ethDAI is the credit money to ETH’s commodity money. This vision for ETH and DAI can seem a bit overreaching, but I believe this is a natural path forward for the ecosystem. ETH is digital gold (eventually to become a digital sound money used for store of value, medium of exchange, and unit of account). ethDAI is digital credit, leveraged from existing assets in one’s portfolio excluding ETH (remember, one wouldn’t lock up ETH to borrow ethDAI, just as they wouldn’t lock up USD to borrow DAI). MKR is a governance/insurance hybrid that maintains the stability and integrity of ethDAI. *There might be a way around this. The statement is currently true because the only way new ETH can be issued is through the block reward. Purely as a thought experiment, however, one could envision MakerDAO implemented at the protocol level, allowing for locked up collateral to issue real, authentic ETH. The governance system would have to be extremely strong to impose this sort of risk on the entire Ethereum ecosystem, however. Big shoutout and thanks to Linda Xie, Jordan Clifford, Rich Brown, and Jordan Palmer for their valuable feedback. Cyrus Younessi is Director of Research and Trading at Scalar Capital Management, LLC, an investment manager focused on cryptographic and blockchain related assets. Scalar Capital holds or may invest in the assets or asset classes described in this article. Thanks to Linda Xie, Jordan Clifford, and Jordan Palmer.